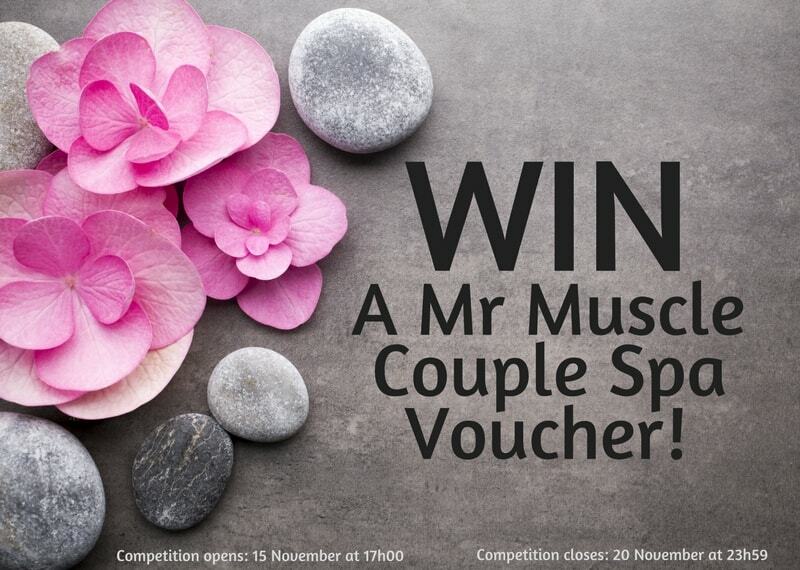 Mr Muscle Couple Spa Voucher competition! 1 winner will receive a Couple Spa Voucher for the Winner and a partner to the approximate value of R 2 520.00! SMS the keyword "Mr Muscle" followed by your name, surname and city to 33650 within the Competition Period! 2.1. Entries for the Competition will open at 17h00 on Tuesday, 15 November 2016 and will close at 23h59 on Sunday, 20 November 2016 (Competition Period). 6.1. The Winner will receive a Couple Spa Voucher for the Winner and a partner to the approximate value of R 2 520.00 (two thousand five hundred and twenty rand) (Prize). 6.2. The Prize can be redeemed at any participating Spa as indicated on the Prize voucher and shall be subject to the standard terms and conditions for such vouchers. 6.3. The Prize excludes all items not mentioned in clause 6.1. For the avoidance of any doubt, the Prize excludes any travel costs and/or arrangements to attend a Polynesia Spa to redeem the Prize. 6.4. We will contact the Winner per telephone to obtain address details and to make arrangements for delivery of the Prize. The Prize may be delivered per email within 5 (five) days from confirmation of the Winner.